One more fabulous choice for New Year's! One more fabulous choice for New Year's.....what to do? The Culver's Club: NEW YEAR'S EVE "JAZZ EXTRAVAGANZA"
A four course sit-down dinner with choice of entree, midnight champagne toast,wait staff gratuity, best in jazz music and an assortment of New Years party favors to celebrate the arrival of the new year! $110 per person, Specialty overnight packages also available. (310) 649-1776 x 4137 to purchase your tickets! Final Pick of the Week for 2010!!! It is the final week of 2010 and I am trying to make my way out of a NYC snow storm back to what I hope is sunny Venice Beach. 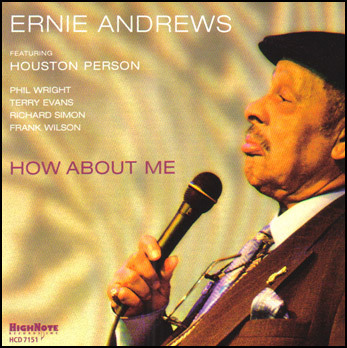 What shall be the Pick of the Week?…..Well let’s talk about New Year’s Eve. See below, this first one, “Wokano’s Black and White Ball,” is my pick. Not too expensive, somewhere hip on the Westside where you can meet up with your buds….there’s still time to get a deal if you order now. The second is a local favorite, the famous “Hal’s Restaurant.” I have wonderful memories of one very romantic New Year’s Eve at Hal’s. It is a great way to welcome the New Year! If you live in Venice, it is always nice to stay close. Make sure to call for reservations now. The third and final choice is a bit pricey, but heck, it is New Year’s Eve….this would be the time to splurge. The Viceroy is quite the mesmerizing hotel. Whichever you choose, see below for more details and have a wonderful, safe New Year’s! WHAT: Wokcano Santa Monica will ring in the New Year with a Black and White Masquerade Ball on Friday, December 31, 2010. The evening's festivities will feature music by DJ Frankie and live entertainment by Brazilian Samba Dancers and Fire Dancers throughout the night. Admission is $40.00 in advance and $50.00 day of and includes passed hors d'oevres and an open vodka bar from 9PM -10PM. Black & White Cocktail Attire & Masks are required. Admission includes party favors and a champagne toast at midnight . Parade this multi-level nightclub" outdoor patio in a classy disguise this New Years Eve! The menu includes Spicy Crabmeat Tempura Roll, Fresh Tuna with Truffle Oil on Flatbread, Spicy Tuna on Crispy Rice, Glazed Walnut Shrimp, Pan-Fried Chicken Dumplings and Yakitori Chicken Meatballs. TICKETS: General admission tickets are $40.00 in advance and $50.00 day of. Tickets are available at www.wokcanonewyears.eventbrite.com. VIP $50 (front of line access). Recognized as Santa Monica's most vibrant lounge, Cameo Bar is a destination for locals and world visitors alike. Viceroy's poolside patio will transform into an unforgettable New Year's Eve celebration with the Main Tent spinning music by world-renowned DJs while guests put on their dancing shoes and dance the night away over our covered pools. The night will showcase music by Mayer Hawthorne and Classixx. Other special guest DJ's to include Jason Bentley and Raul Campos of KCRW. For additional information, please call +1 310 260 7507 or email events@viceroysantamonica.com. Exclusive private cabanas can be rented for the evening. Cabana service includes dedicated platters of food plus bottle service. To reserve a cabana, please call +1 310 260 7507. Hope you all enjoyed the holidays. Now that they are over, take a moment to relax and smell the roses. Stop by Figtree’s Cafe and enjoy delicious happy hour specials as well as an incredible art show. This week, Figtree's Cafe is featured in the Argonaut, (pg 14) with a photo showing Dianne Neuman's "Venice Lights". This special art exhibition at Figtree's displays works by David Hinnebusch, Dianne Neuman, Sam E. Razar and others. Figtree’s famous happy hour is always available with food specials such as tasty quiche and delicious hummus with pita, etc for just $5.00 or $6.00 as well as $4.00 wines, sangria and $3 imported beers. Figtree’s Café is a charming restaurant and bar, located right on the Venice boardwalk at Paloma Ave, just two blocks south of Rose Ave. Figtree’s has been voted the best restaurant on the boardwalk since 1978. Their delicious fresh healthy food is their signature and their relaxed ambiance has kept Figtree’s at the top of the best restaurant lists. Figtree’s Cafe is located at 429 Ocean Front Walk Venice, at Paloma Ave, two blocks south of Rose. Yes, sometimes, I actually do get out of Venice. Tomorrow afternoon, December 19th, make your way out to Pasadena. Live music and beautiful art on a not so sunny day in LA. Amy Delaporte is helping to put on this show with these two hosts, Lou Kalogerakos and Robert Kyle. See info below, Appetizers and refreshments will be served make sure to rsvp. Hope to see you tomorrow.....I'll be there. The event will be held from 1-4 P.M. at the home of Michel Macho, 290 North Mar Vista Ave, Pasadena. Live music will also be part of the celebration with performances by Jacob K, Robert Kyle & Stephan Oberhoff. For more information, contact Lou Kalogerakos at 818.306.0420, or Robert Kyle at 626.797.9855. Tomorrow, Thurs, Dec 16th start off the Venice Art Crawl at Figtree’s Cafe from 6:00 pm till 8:00 pm with a very special opening, featuring works by David Hinnebusch, Sam E. Razar and others. Figtree’s famous happy hour will be available with food specials such as tasty quiche and delicious hummus with pita, etc for just $5.00 or $6.00 as well as $4.00 wines, sangria and $3 imported beers. Figtree’s Café is a charming restaurant and bar, located right on the Venice boardwalk at Paloma Ave, just two blocks south of Rose Ave. Figtree’s has been voted the best restaurant on the boardwalk since 1978. Their delicious fresh healthy food is their signature and their relaxed ambiance has kept Figtree’s at the top of the best restaurant lists. 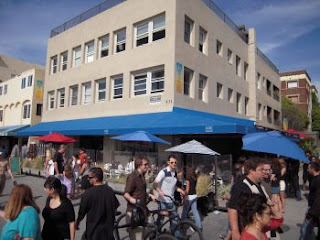 Figtree’s Cafe is located at 429 Ocean Front Walk Venice, at Paloma Ave, two blocks south of Rose. www.figtreescafe.com. (2 Rose Ave on the Venice Boardwalk) as well as Lindsey Nobel and Martin Linns. The Venice Ale House offers a happy hour from 6:00 pm till 7:00 pm. Some sweet deals from Figtree’s Café. Winter in LA, how lucky we are. The weather has been amazing, and the sunsets remarkable, so why not drop into Figtree’s Café tonight for an inexpensive dinner and marvelous views? If you haven’t been to Figtree’s you are in for a treat. Located right on the Venice Beach boardwalk, they offer friendly service, fresh delicious food as well as drink specials and spirits, all in the heart of Venice Beach. The sunset is calling you. Take a break from the holiday madness and treat yourself to Figtree’s delectable happy hour, while enjoying the best of the Venice Beach boardwalk. People watch while dining on yummy appetizers for just $5.00 or $6.00. Also on Happy Hour are $4.00 wines, sangria and $3 imported beers. An incredible value, available every night between 3 pm and closing every weekdays, Monday thru Friday. If you happen to be a morning person, take advantage of the breakfast happy hour 8 to 9 am 50% off on everything but alcohol, 7 days a week except major holidays. There is nothing like LIVE THEATRE, This weekend treat yourself and your loved ones to the exciting experience of a live performance. 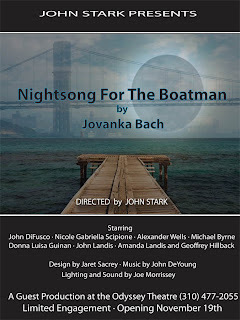 John Stark presents, NIGHTSONG FOR THE BOATMAN by Jovanka Bach which is playing now at the Odyssey Theatre (2055 S Sepulveda Blvd 90025). 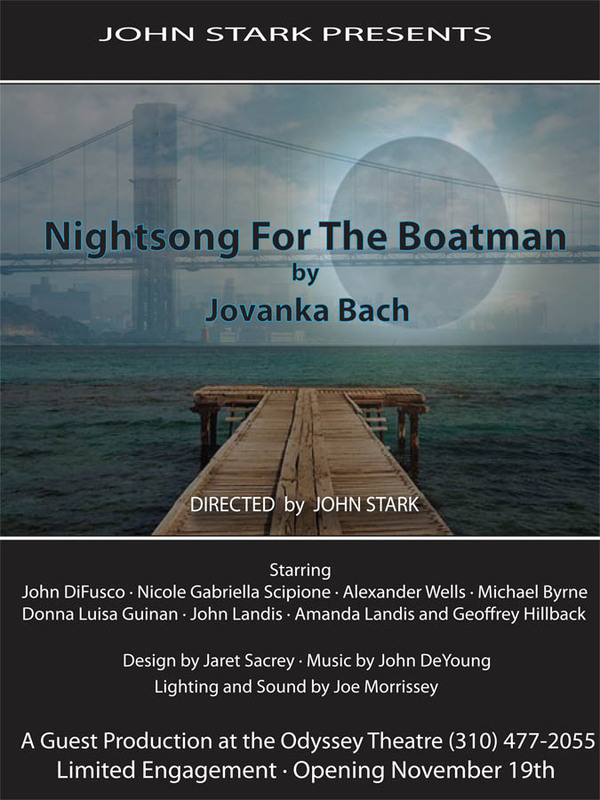 This is the final weekend and you won’t want to miss this fabulous production directed by John Stark. Showtimes are Friday Dec 10th and Saturday Dec 11th at 8:00 pm as well as Sunday Dec 12th at 2:00 pm. Here is a quick synopsis of the show. Harry Appleman, an aging, washed-up poet, plays dice with fate, and loses. Through various cunning contrivances he tries to avoid his mortality. He discovers his humanity when he learns he can’t sacrifice his daughter, but a tricky graduate student will do. Come celebrate the Holidays with The Jingle Bell Rockers…..This Wednesday Dec 8th …..Free BABY!!! All night long 7:00 pm till 10:00 pm. The happy hour menu and drink specials will be extended till 8:00pm….for this night only…..So come early and take advantage of the yummy deals and festive atmosphere…..
We’ll whip you into the spirit with our spunky renditions of classic carols, quirky lyric additions and of course our bluesy originals. Just in case you have been living under a rock… The Jingle Bell Rockers have been performing together for the past 8 year. We bring a vibrant, zany twist to the traditional Christmas Carol and also perform several originals. With our flamboyant costumes and bawdy presentation The Rockers will spice up any holiday party. 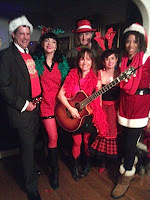 We are still accepting bookings ….email soon to reserve The Jingle Bell Rockers for your holiday party. 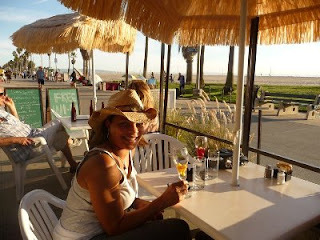 Come on down to Dannys Venice Beach Bistro and Bar this Wednesday Dec 8th at 7:00 pm till 10:00 pm . (23 Windward Ave.) Enjoy one of their famous Mojitos, a delicious dinner and some tasty treats. Revel in the holidays with The Jingle Bell Rockers. Happy hour is extended till 8:00 pm. Admission is FREE! PICK OF THE WEEK.....it's all About the HOLIDAYS ....WE WILL BE JINGLE BELL ROCKIN!!! Don't forget tonight....Main Street.....in Santa Monica....see this week's Argonaut and yesterdays blog for more info...and link below. Venice celebrates the Holidays with The Jingle Bell Rockers. Tomorrow, Sunday December 5th, the Abbot Kinney Holiday Extravaganza features this zany group of professional singers, who have been spicing up the holidays here in LA for the past 8 years. 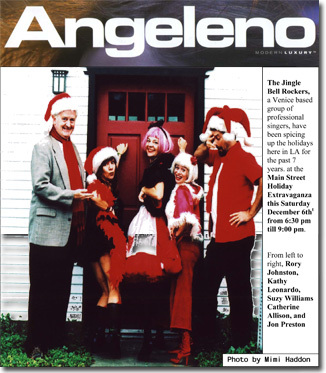 The Jingle Bell Rockers are proud to be a part of The Abbot Kinney Holiday Extravaganza once again this year. The event runs from 3:00 pm till 8:00 pm. Sunday Dec 5th. The Rockers will be meeting up with Santa Claus at Tales and Toys 1140 Abbot Kinney, at 5:00 pm then stroll up and down Abbot Kinney, between Venice Blvd and Westminster Blvd. Kids of all ages, come to the Wintry playground with SNOW at the Brig Parking lot 1515 Abbot Kinney. Please join our local Police and Fire Departments and donate a new unwrapped toy. The Jingle Bell Rockers are very excited to be performing again this year at The Main Street Holiday Extravaganza this Saturday December 4th from 6:00 pm till 9:00 pm . This FREE event begins with a Christmas tree lighting at Ocean Park and Main, (the site of the Sunday Santa Monica Farmers Market) followed by a candlelight walk to an amazing Shopping Cart Christmas Tree at Edgemar Pl (by Ben & Jerry’s and Peet’s Coffee, 90401) where The Jingle Bell Rockers will sing a set, before they move on down the Street. Most of the stores on Main Street will stay open and the Rockers will be stopping in to spread holiday cheer. Make sure to arrive at Edgemar Place by 6:15 to catch the Rockers. Over the years, they have gained quite a fun reputation, so people have started to come early to reserve a spot. # 2 Holiday shopping Event, right down the street from where we will be performing....Come early, park, do some shopping then stop in to see us sing and enjoy free cider, cookies and coffee. Enjoy two wonderful days of holiday shopping in Los Angeles! My friend Fahmina makes the most beautiful leather purses and waist bags....simply gorgeous www.fahmina.com. Fahmina will be at this event showing her line of accessories. Plus there will be 25 + cream of the crop art/ design/crafters with the most interesting, unusual and affordable gifts for everyone on your list. Free Peet's coffee, Coconut Bliss, and a charity raffle for Y.O.G.A. for Youth. Visit their website for all the details! My good friend Michael Baroff is showing a series of "Dancing Gesture" drawings as part of a group show -- "Small But Powerful" (work 8"x10"maximum) at the Blue 7 Gallery. The reception is Saturday December 4th from 6-9 PM. I may make it later, after my gig. Yes this Friday Dec 3rd is First Fridays on Abbot Kinney....but NO, it is NOT the Abbot Kinney Holiday Extravaganza. I am still receiving emails concerning this. Sunday is the holiday event. The Jingle Bell Rockers are booked for a private party tomorrow night, but we definately will be performing this Sunday Dec 5th on Abbot Kinney from 5:00 till 8:00 pm. The actual event runs from 3:00 pm till 8:00 pm. Sunday Dec 5th. The Rockers will be meeting up with Santa Claus at Tales and Toys 1140 Abbot Kinney, at 5:00 pm then stroll up and down Abbot Kinney, between Venice Blvd and Westminster Blvd. Kids of all ages, come to the Wintry playground with SNOW at the Brig Parking lot 1515 Abbot Kinney. Please join our local Police and Fire Departments and donate a new unwrapped toy. Tonight and this weekend....Art, Wine, and more to come! So much to do this weekend.....not sure what will be the pick of the week.....I am leaning towards all the holiday events...Don't ya think? However I will be posting some options for all you holiday bashers. If you have lost all of your jingle balls and want to steer clear of the holidays, there are several great art openings happening in the downtown area as well as the westside.....stay tuned. Well Guess who’s back??? The Jingle Bell Rockers a Venice based group of professional singers, have been spicing up the holidays here in LA for the past 8 years. The Rockers are very excited to be performing again this year at The Main Street Holiday Extravaganza this Saturday December 4th from 6:00 pm till 9:00 pm . The event begins with a Christmas tree lighting at Ocean Park and Main, (the site of the Sunday Santa Monica Farmers Market) followed by a candlelight walk to an amazing Shopping Cart Christmas Tree at Edgemar Pl (by Ben & Jerry’s and Peet’s Coffee, 90401) where The Jingle Bell Rockers will sing a set, before they move on down the street to spread holiday cheer. Photo by Victoria Graham (from Left to Right) Back Row is Rory Johnston, Marianne Lewis, Suzy Williams and Jon Preston. Front Row is Kathy Leonardo and Catherine Allison. The Jingle Bell Rockers are not your typical holiday group. Yes they happen to be terrific singers, but they also dress incredibly flamboyant, and have an amazing amount of energy which makes for a truly fun and lively show. They add a different slant to Christmas Caroling. Their offbeat harmonies and original arrangements bring a zany twist to the classic Christmas Carol. They even perform their own original songs. 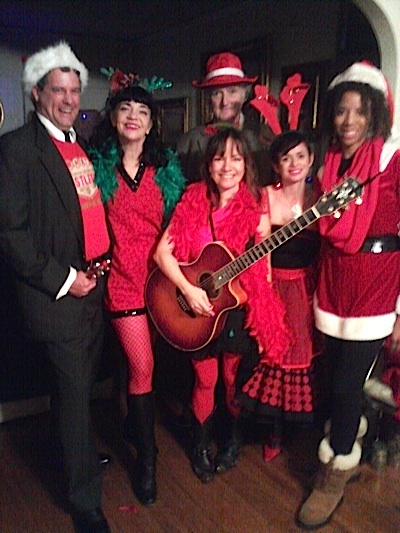 The Jingle Bell Rockers are still accepting bookings for private parties. Email ktrpromo@yahoo.com. Avoid the madness, a peaceful place to shop this weekend. Thanksgiving is over, but Christmas and Hanukah, Kwanzaa and the Winter Solstice are all right around the corner. With the Black Friday sales continuing through the weekend don’t let yourself get caught up in the Holiday madness…There are still some peaceful places to shop and there is one in particular that offers a breathtaking, relaxing atmosphere. This is the last weekend to enjoy the Holiday Boutique at beautiful Lake Shrine in the Palisades. These exquisite grounds are open to all who desire escape from the daily stresses of living in LA. Add to that, the fast approaching holidays and you’ll find it’s hard to keep your head on straight. Today and tomorrow Dec 27 & 28th from 10:00 am till 4:00 pm, treat yourself to a peaceful place to shop. The Holiday Boutique features holiday gifts for sale. Hand-made jewelry, fashion accessories, decorative home items, one-of-A-kind collectibles, holiday decorations, stationery, journals and cards. Also enjoy, entertainment, vegetarian specialties, sweets, fresh smoothies and hot cider will be available in the courtyard. Make sure to leave time to take in the beautiful landscape. Create your own holiday moments filled with peace! I have been to Lake Shrine many times, some for the services on Sunday and other times just to meditate, sit in silence or walk the incredibly soothing path. You do NOT have to be religious to come here. Lake Shrine welcomes all religions and all people. They only ask that you keep your voice to a very low volume and leave your cell phone in the car! Yes, we all may be a bit fuzzy from the tryptophan and all those Thanksgiving gatherings. However, life goes on. Yes there are a gazillion black Friday sale events, and you may find yourself staggering out to several of them….so why not take respite and stop in at The Happening Gallery in Marina Del Rey for some complimentary eggnog surrounded by mesmerizing art? Less Stress this Turkey Day...EAT OUT! What can I say? If you are not a cook, don't know anyone who is a cook....or just need a break; treat yourself to a wonderful meal. Grab a couple friends and get over to Campanile. Sit back and be catered to at this grand historic restaurant. Had a wonderful Thanksgiving meal here, the ambiance is stunning, I highly recommend it. Call NOW as they are nearly at capacity. Campanile is housed in an historic and dramatic structure built in 1929 by architect Roy Sheldon Price for Hollywood legend Charlie Chaplin. Mr. Chaplin originally intended to use the building for personal offices, but surrendered ownership to his second wife, Lita Grey, as part of their divorce settlement. In the late 1980s, following decades of neglect, the building was purchased by Executive Chef Mark Peel, former Pastry Chef Nancy Silverton and former Wine Director Manfred Krankl. Architect Josh Schweitzer supervised a complete remodel, converting the structure into a magical space intended for a bakery and restaurant. La Brea Bakery opened in January of 1989, with Campanile following six months later. $65 (1/2 off for kids under 12) Traditional fare includes such offerings as mushroom barley soup, rosemary-charred turkey breast, savory bread pudding and mashed potatoes, among others. Reservations from 2-8:30 pm. BUT NO! This year the Holiday Extravaganza will be Sunday Dec 5th from 3:00 pm till 8:00 pm. However, don't let that stop you from starting to celebrate the Holidays Friday night. It will be a busy weekend. Lots more events...I will keep you posted! There is a rumor that the Jingle Bell Rockers may be on the street for First Fridays as well as the AK Holiday Extravaganza. Several stores have inquired and are trying to pursuade us. We'll see. We are definately booked for Sunday Dec 5th. Yeah! Where did November go? I can't believe Thanksgiving is almost here. What the heck? As most of you may know I am a proud member of The Jingle Bell Rockers and every year we get together and spread holiday cheer in our own zany way! We've got lots of gigs booked. I will keep you posted on where and when all of these fun FREE events are. Here is some info on the Rockers and the upcoming Santa Monica Holiday Extravaganza. Gotta get out to this one, it'll snap you right into the holiday season. So save the Date! Guess who’s back??? The Jingle Bell Rockers a Venice based group of professional singers, have been spicing up the holidays here in LA for the past 8 years. will stay open and the Rockers will be stopping in to spread holiday cheer. video was shot by Victoria Graham. For booking info email me at kathy@kathyleonardo.com; or call 310 428-1109. The Jingle Bell Rockers are not your typical holiday group. Yes they happen to be terrific singers, but they also dress incredibly flamboyant, and have an amazing amount of energy which makes for a truly fun and lively show. They add a different slant to Christmas Caroling. Their offbeat harmonies and original arrangements bring a zany twist to the classic Christmas Carol. They even perform their own original songs. The Jingle Bell Rockers include Catherine De La Casas, Rory Johnston, Marianne Lewis, Kathy Leonardo, Jon Preston, and Suzy Williams. The Jingle Bell Rockers Bring Back Holiday Cheer! The Jingle Bell Rockers are at it again- bringing good holiday cheer to local Venice, Santa Monica and Los Angeles venues and holiday festivals. For the past 5 years, the Rockers have delighted audiences of all ages with their hilarious and mischevious new take on holiday favorites. They are being brought back by popular demand to the Main Street Holiday Tree Lighting in Santa Monica.